Before September came around I had to make sure that I gutted and cleaned every inch of my room - most importantly my makeup area. dun dun dun... but after plucking up the courage to do it I spent an entire Sunday morning tidying up the nooks and crannies of my makeup 'area'. Thought I would document my time and show you how I managed to do it all within a few hours. I don't have the biggest makeup collection, but what I do have to doubles of everything and frankly things that I haven't worn in a really really long time. I have the Ikea Chest Drawer thing, it has three draws and then this top section as well. In the first draw i keep all my makeup and skincare and then the top holds all my clear storage that looks really pretty. I am always getting things out to use and then am far too lazy to then put them back in the right place and then it leads to having everything everywhere and no room to breathe. 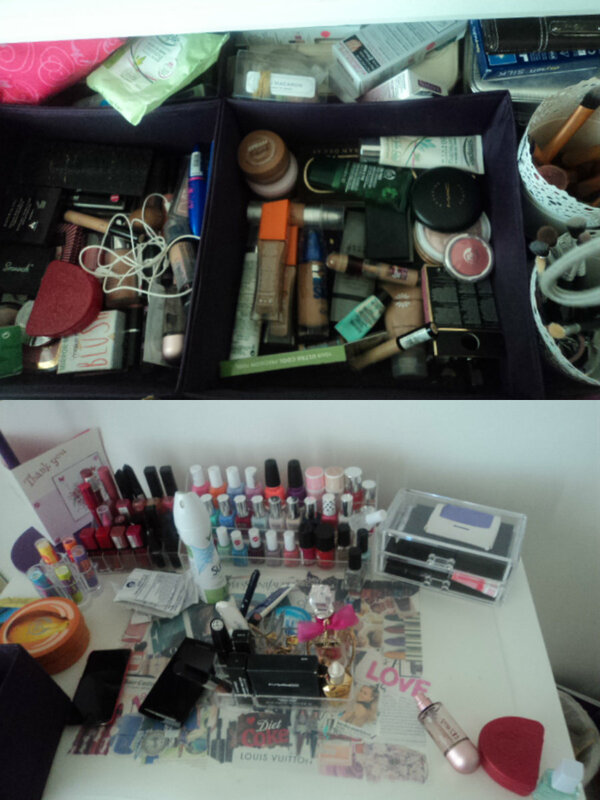 The first thing I did was empty all my makeup and skincare bits on to the floor and sort them into piles of stuff. Hiding in the corner is the two pots of my very dirty makeup brushes, along with lips at the top right, then face, cheeks, eye shadow, eyes and then skin. This made it a whole lot easier to see what I own and to start the next stage. This is the 'Clean and Get Rid Of Stage' here you need to seriously decide what is worth keeping that you will carry on using and the things that you haven't touched or can't remember about and bin those. I will admit that if you are a beauty lover like me, you tend to hold on to things because of the price, or the memories that come with it. But I was being really brutal this time! Eventually, I managed to sort through everything and have my breakfast whilst doing so.The end result made me feel proud and very pleased with myself. The draw is now in different sections instead of all jumbled up. 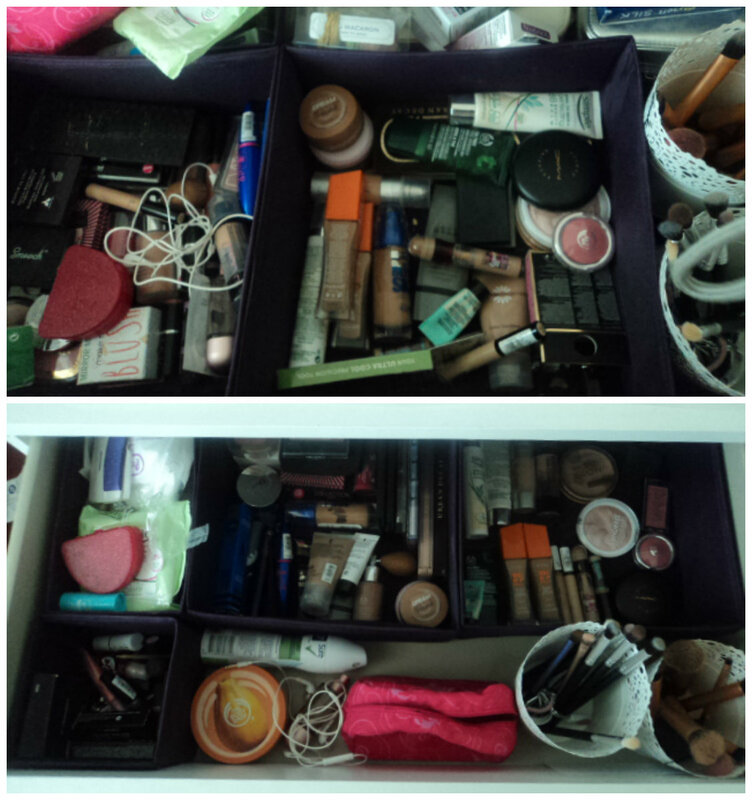 In the top left long box we have skincare, below that in the tiny box is full of 'more lip produtcs'.. In the two bigger boxes I decided to have a box full of eyes and various face products and then the other has all my base products and cheek products. Then a body butter, deodorant can, makeup bag, headphones and brushes (which should really be clean now!). 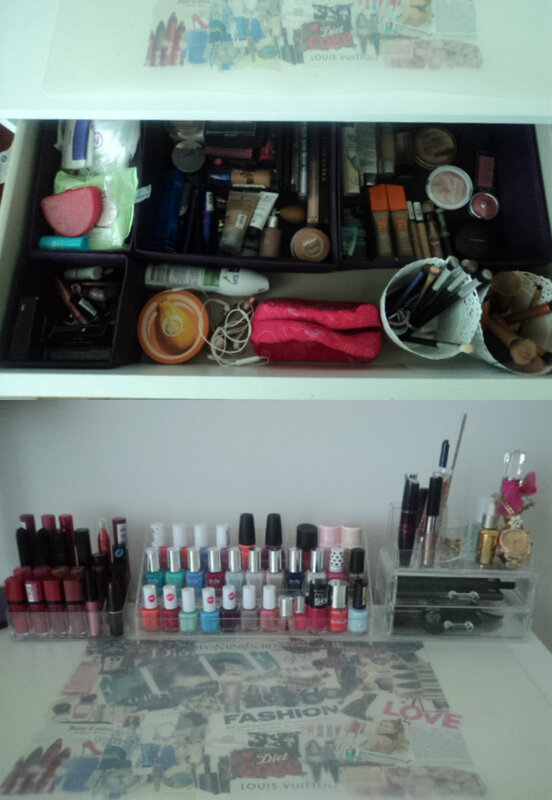 On top I managed to nicely organise my storage so that all my lipsticks/glosses/balms are together in height ish order. I have a thing about things that need to look right. All my nail polishes are sorted by brand (spy all the barrym gelly's!) and then the draws have the smaller eye shadow palettes in along with some perfume and nail care essentials that I need to use more. Hope you enjoyed this different type of post! Great post! Inspires me to go and organize not only my makeup collection but entire desk and vanity area! Go do it, it feels amazing! !